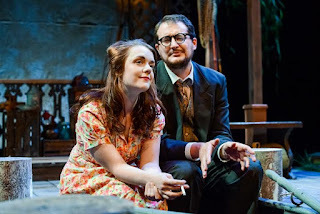 Talley's Folly, now showing at Artistry's Black Box Theater (through July 24) is an intriguing idyll for a summer theater night. On the Fourth of July, 1944, two unlikely lovers reunite for the first time in more than a year. Matt has every intention of marrying Sally, but family ties and hidden pasts prove difficult to overcome. By turns thoughtful and funny, this Pulitzer Prize-winning romance examines the lengths people are willing to go for love. 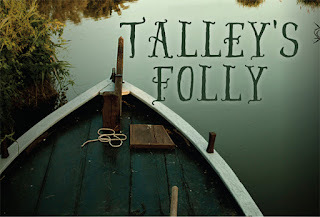 Written by Lanford Wilson, Talley's Folly won the Pulitzer in 1980 and is part of a trilogy of plays known as the Talley Cycle, which includes Talley & Son (also set in 1944) and Fifth of July (set in 1977). After seeing this play, you will definitely want to catch up on the further adventures of Talley and Co.
Talley's Folly features just two characters: Matthew Friedman (David Beukema) and Sally Talley (Chelsie Newhard). Big city, fast talking Matthew is trying to woo the prickly, defensive Sally and among all of the banter, some pretty tough truths emerge. Did I say fast talking? David Beukema as Matt has so many quick and hilarious lines and asides that I think it was hard for the audience to absorb them all. He delivers them hilariously, and portrays the rather tough character of Matthew with his customary lovable charm. Chelsie Newhard, as Sally, has a tough job as well: She simply will not let herself be loved. Sidebar: Does this happen a lot in real life? That people will not let themselves be loved? Cause it sure does in movies and theater. The fabulous How Did This Get Made bad movie podcast discusses it at length. In her Director's Note, Angela Timberman, wildly gifted actress and local treasure, says: "I'm a sucker for a good romance. Especially when the characters are complex, funny, and vulnerable. Throw in some mystery, nostalgia and moonlight and you've got Talley's Folly." Beautifully said! And can we talk about the set? Before even opening the program, I had a feeling the set was by Joel Sass (and yes, I was right). The setting is a boathouse on a farm in Missouri. There's a dock, a rowboat, beautiful lighting, lanterns, a moon, fabulous detailed props, and the entire set is framed by a horseshoe, which adds to the fairy tale-like feeling of the play. It's utterly lovely and fits the play beautifully. It seems a shame that it will have to be broken down at some point--I'd love to go back and visit again. BTW: If this play leaves you wanting to know more about Lanford Wilson (as it did me), the New York Times wrote a lovely obituary for him after his passing in 2011. Dear Theaters - Can We Talk About Your Website?